The famed ruby mine deposits of Burma are home to the finest rubies in the world. 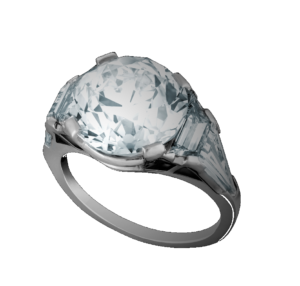 They are renown for their fine red color and superior quality to rubies from other regions. Burmese rubies are without parallel and command a premium in the market. 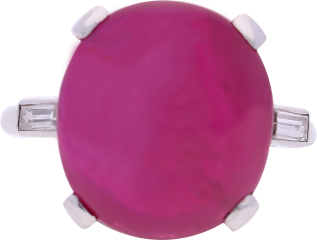 This ring centers a 10.88 carat burmese star ruby. A “star” gem stone takes on a smoother and more spherican shape then the typical gem, and when a light is shone on the gem, a “star” shaped light emits from the reflection of the light. This miracle from nature commands attention from many enthusiasts and connosieuers and has created a quite robust market for “star” gemstones”. This ring is flanked by step-cut baguette diamonds and set in platinum. 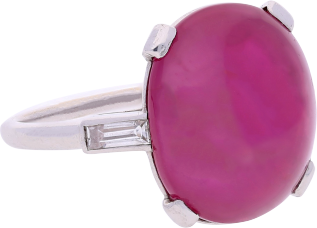 This incredible gem is a magnificent natural purple red color. 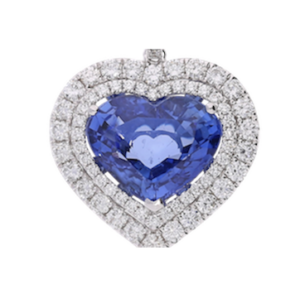 It is unheated, meaning it is as beauttful as nature intended it to be and free from the tampering and quality enhancement that is prevalent in todays market. This gem is classified by AGL to be of “Burmese” origin and of no “heat”. 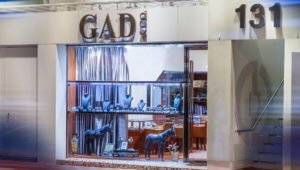 Gad & Co is home to some of the world’s most desirable and sought after diamond and gemstone jewelry. In our collection of quality gems, you will find masterworks of nature mounted in goldplatinum for sale, sourced from around the world and across centuries. Our diverse collection offers a broad selection and a level of quality that can’t be matched by any other retailer in Hong Kong.They say a diamond is forever, and we make it our mission to create relationships that- like diamonds- are forever. Enjoy browsing our catalogue and discover why so many of the world’s elite connoisseurs buy from Gad & Co.